Finally it's here, the worlds finest quality dynamo hub is now available to fit narrower 74mm OLN - 9mm Axle Dahon forks! 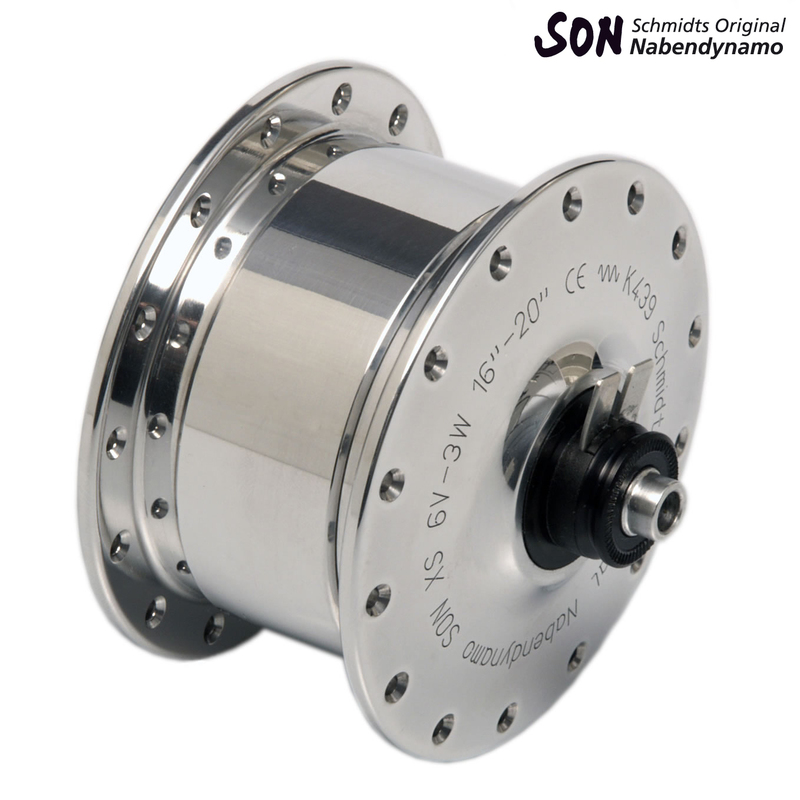 The Schmidt Dynamo front hub or SON (Schmidt's Original Nabendynamo) offers significantly less drag than tyre driven dynamos. Further benefits include reliability & ultra long life (designed to give 50,000 kilometres minimum), the fact it's sealed from the elements & unaffected by corrosion, no possibility of slippage on the tyre unlike a sidewall dynamo, and once fitted, it's always there. Made by Wilfried Schmidt Maschinenbau in Tubingen, Germany, the hub is quiet and reliable. Though sealed, the unit is serviceable if returned to Schmidt (through us). The hub powers several different headlights including Schmidt's own E6 and both Lumotec and Lumotec Oval Plus headlamps as well as taillights made by Busch & Muller in Germany, and modified by Schmidt for use with the SON. This version of the hub is designed for 16" to 24" wheels. Weight 640g inc. Allen Key ended skewer included, power output 6V 3W. Spade terminals sit on RIGHT side when fitted to bike. Do You Sell This Product Built Into An Appropriate Rim? If you do sell it built into a rim, what is the price please? I'm afraid we don't have this one pre-built into a wheel, we can build it up into a rim of your choice though. To do this just add the rim and hub to your basket along with the relevant wheel build option.